Above are teeth from two different species of white shark, Carcharodon megalodon and Carcharodon angustidens, both of which are extinct. These teeth were collected in the phosphate beds of Charleston County, South Carolina, in the early 1900s. The smaller tooth on the left is from an adult Carcharodon angustidens, which is a smaller species of extinct shark. The odd indentation on the top left of the tooth is an abnormality, or pathology. Rather than resulting from an accident or injury, this particular tooth became distorted as a result of a developmental condition when the shark was still young. 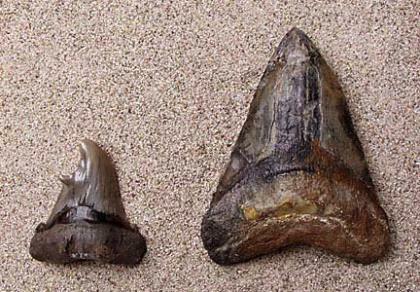 The larger tooth on the right is from the largest of the known fossil sharks, Carcharodon megalodon. C. megalodon occurred throughout much of the world during the Miocene and Pliocene - from about 20 million years to 3 million years ago. At 5 1/2 inches, this particular tooth is typical of the large teeth found that belonged to C. megalodon; however, the largest C. megalodon teeth ever found have been over seven inches! The museum's Research and Collections Division holds a large number of shark teeth from all over the world in its collections. A current research project being conducted by Paleontology Department staff on marine vertebrates from South Dakota and Minnesota, to be published in 2002, includes studies of fossil shark teeth. Sharks, both living and extinct, were featured at the Science Museum of Minnesota in two Omnitheater films, Island of the Sharks, and Search for the Great Sharks; and two exhibits, Sharks! Fact and Fantasy and Shark-a-Bet: A Shark Infested ABC. The films and exhibits ran through February 14, 2002.